The UNFCCC Paris Agreement on fighting climate change, the first-ever universal, legally binding global climate deal, will come into force next month, having met the necessary conditions much earlier than predicted, as the European Parliament agreed to its ratification by the European Union in a historic vote on Tuesday. The EU will join the US, China and India, other global players and major greenhouse gas emitters, at a November meeting of Parties to the Paris Agreement (CMA) in Marrakesh. 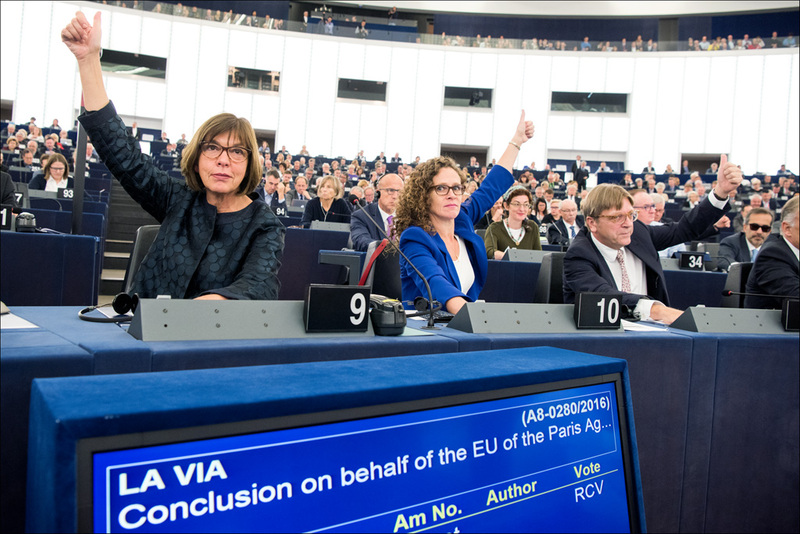 Parliament gave its consent to the EU’s ratification of the Agreement by 610 votes to 38, with 31 abstentions. Ratifications representing at least 55 Parties and 55% of global emissions are needed for the Agreement to enter into force. While the first condition is already met, today’s vote allows the second to be met too, thus triggering the entry into force. “Our vote paves the way to ensure that the agreement meets the necessary threshold (...) The entry into force of the Paris agreement less than one year after its signature is a massive achievement, given that it took eight years for the Kyoto protocol. Today’s vote also means that the EU remains a climate leader” said European Parliament President Martin Schulz who signed the letter of transfer for Parliament’s consent to the EU ratification in the presence of UN Secretary General Ban Ki-moon, French environment minister and COP21 President Ségolène Royal, Slovak State Secretary Ivan Korčok, representing the Presidency of the Council, European Commission President Jean-Claude Juncker, and EP rapporteur Giovanni La Via (EPP, IT). “The European Union has a long track record of leadership against climate change”, noted Mr Ban Ki-moon before the vote. He thanked MEPs and stressed the importance of the EU’s ratification. He also added that fighting climate change is not only one of the most important challenges of our times, but also an opportunity to build a more sustainable and competitive economy and more stable societies. Most speakers from political groups stressed that today’s vote also shows that cooperation and tackling issues together are the only solution to global problems. They also insisted on the urgent need to implement the agreement, and to pursue negotiations on the global stage. “This is the outcome of a great work together” showing that “Today we can!” said Mr La Via. Now that it has Parliament’s consent, the Council can formally adopt the Decision via a written procedure, so that the EU, together with the seven member states that have completed the ratification process, can deposit the ratification instruments in the UN headquarters in New York by this Friday 7 October. MEPs will also vote a resolution on Thursday setting out their priorities for the next round of talks to start in November in Marrakesh to focus on the effort-sharing among the Parties that will be needed to meet the Paris targets. Seven member states have completed their national domestic processes so far: Hungary, France, Slovakia, Austria, Malta, Portugal and Germany. These 7 MS account for some 5% of global emissions. Ratifications representing at least 55 Parties and 55% of global emissions are needed for the Agreement to enter into force. To date, 62 Parties, accounting for 51.89% of global emissions, have formally deposited their instruments of ratification. The European Union accounts for some 12 % of global greenhouse gas emissions. Against this background, and thanks to the EU ratification, the Paris Agreement will enter into force in time for the COP 22 Climate Change Conference in Marrakech from 7-18 November 2016.